AFTER it almost tripled in value over the past year, KNM Group Bhd’s share price lost momentum recently, sliding about 20% to close at 83.5 sen on Sept 18 (Thursday). How­ever, the group’s earnings visibility is intact, given its order book of RM2 billion and the many upcoming oil and gas contracts it could benefit from. Meantime, weaker year-on-year financial results and a lack of new jobs have dragged KNM’s shares down; but there are catalysts for growth, going forward. 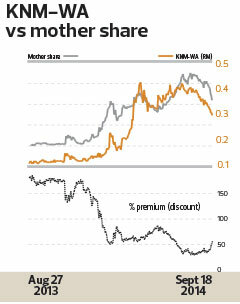 At its close of 29.5 sen on Sept 18 (Thursday), KNM-WA was trading at a relatively high premium of 55.1% to the mother share. However, this can be justified by its long lifespan and the low dividend nature of the stock. The American call warrants, which have a strike price of RM1, expire in November 2017, giving investors ample time to ride KNM’s upside potential. The company is expected to perform better in the second half of its financial year, although earnings in the second quarter ended June 30 were weaker — down 7% y-o-y and 27% q-o-q — but not disappointing, notes Maybank IB in a recent report. “The q-o-q earnings weakness was not entirely a surprise, due to the timing difference in job recognition. Geographically, its Europe segment reported a 29% or 5.1 percentage point fall in earnings before interest, tax and depreciation (Ebitda) and Ebitda margin to RM40 million. This was offset by stronger operations in its Asia and Oceania segment (Ebitda: +164%, margin: +7.6 percentage points),” the research house adds. It has a “buy” call on the stock and a target price of RM1.50. That’s a 79.6% upside for the stock and 69.5% upside for the warrants at current prices, assuming zero premium. Assuming a 20% premium, the warrants would gain 171.2%. The catalyst for the rest of the year could be more contracts, particularly from Petroliam Nasional Bhd’s Refinery and Petrochemical Integrated Development (RAPID) complex in Pengerang. Note that the group in August, bagged US$280 million to US$300 million worth of jobs from the RAPID project. “We expect more contracts for KNM over the next six months, as the subcontracting work at RAPID is being progressively delegated. KNM’s current tenders for RAPID-related works total US$8 billion, and we expect US$800 million to US$1 billion job wins from RAPID over a three-year period,” Maybank IB says. The company’s stock and warrants are worth keeping an eye on, especially if the decline continues and more value emerges.